does anyone remember when still at school, staring out of the window on a sunny june afternoon, daydreaming about anything other than the subject of the class in which you were sitting? i'd love to concur with those who answered yes to that question, but in fact the secondary school which i attended consisted predominantly of a large, sandstone building with tall windows and deep window sills that commenced more than halfway up those sandstone walls. such a method of construction had the disadvantage of rendering views of the great outdoors, other than acres of sky, somewhat obscure. oddly, the only time i recall staring out of the window in such fashion was during exams which were mostly held in the assembly hall. that was of more contemporary design (back in the day) with lower windows affording views across the playing fields if sat towards the rear door. anyway, the reason i bring this anecdotal situation to your notice is because of the almost inevitable rebuke from the teacher or invigilator for not paying more attention to the subject at hand. it would seem, in my case at least, that this almost pathological inattention to that set before me continues right up until the present day. 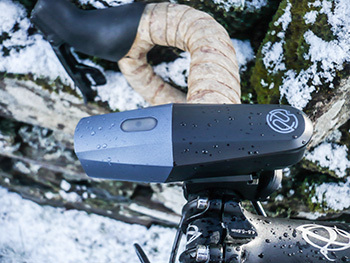 a discussion recently witnessed on an interweb not too far from this browser window involved the remarkable predilection of cycle companies to append numbers as a substitute for a memorable description of their product. its nice to ask for a campagnolo record derailleur, a zipp firecrest wheel or a brooks cambium saddle, even if only online. there's little point in arguing that a pf7000 bottom bracket, a 5703 triple chainset or 4600 road brake calipers bear any favourable comparison. fortunately the ever so slightly eccentric folks at portland design works appear to have an entire filing cabinet of clever apellations thay have yet to use in public. one that has seen the light (see what i did there?) is their lars rover anodised aluminium front light, and it's at this point that my lack of attention has me grovelling at their hypothetical feet. you see, the lars rover is available in two distinct flavours; the 450 and 650, a fact of which i was unaware when the light arrived at the croft for review. in my usual clumsy fashion, i managed to all but destroy the box in which it arrived, so in truth i have no evidence to show which particular model i received. thankfully, pdw's eccentricties stretch as far as colour coding the two varieties. the 450 lumen version features the same charcoal coloured rear section, but a silver anodised front. 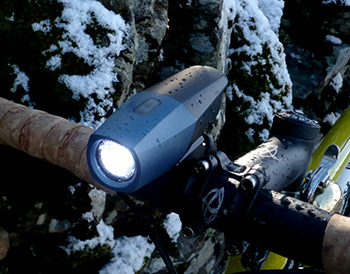 the 650 lumen contrasts this with an almost military blue surrounding the tiny led. how did we ever manage without the interweb? the battery is chargeable via a small usb port on the underside of that blue front section. plugged into the usb port of my macbook air with the supplied cable, the on/off button flashes blue until fully charged, at which point the blue remains always on until disconnected. according to the manual, a fully charged battery can be expected to last 7.5 hours (175 lumens), 4 hours (340 lumens), 2 hours (650 lumens) fast flashing (10 hours) and slow pulsing (10 hours). i rarely, if ever, go riding after dark, partly because i have no real need to, but mostly because there are way too many youngsters driving matt black corsas at speeds that would do credit to lewis hamilton. they've been addicted to this sort of behaviour for so long, it almost qualifies as a local tradition. i really don't fancy becoming a wheeled trophy on their radiator grills after the hours of darkness, so i stay at home. 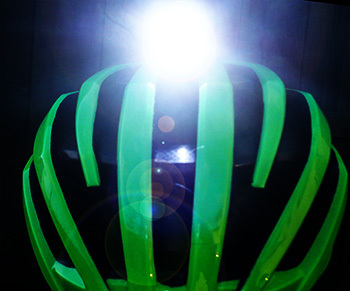 however, should i ever have cause to venture out, the 650 lumen setting is easily bright enough to cause mild distress to oncoming traffic, and certainly provides ample illumination for even the quickest of cyclists. though there's a heavy-duty, screw-on bracket to retain the lars rover's services across the harshest of terrain, i placed my faith in the more standard version even on my 'cross bike. this is tightly affixed to any handlebar by means of a quick release stretch rubber mount intended more for the commuter. i did have a minor conflict with this latter bracket; the release lever, allowing forward removal of the light from the bracket is mere millimetres above the retaining tab of the rubber strap. on more than one occasion, i managed to release the bracket while attempting simply to remove the light. perhaps if the light release were at the front, the problem would go away. or maybe i ought to be less clumsy. for the more adventurous, and i would hesitate to include myself amongst such elite company, there's a strap allowing the light to be attached to the top of an appropriately vented helmet. owners of giro's air attack need not apply. 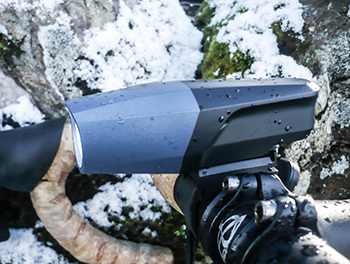 as is the case with many other similar lights, none of the brackets allows lateral adjustment of the anodised unit; at all times (helmet mount excluded of course) the light points directly forwards. 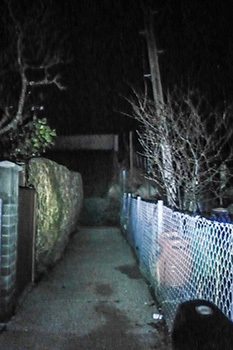 there are several roads around the principality which are totally devoid of any form of street lighting, and in more than just a few cases, without white lines down the centre. in those instances, it's often helpful to have a front light illuminate the edge of the road, thus avoiding any itinerant cattle or sheep. still, it would be slighly iniquitous to level this line of argument solely at the lars rover, for the majority of competing products are similarly constituted. and in truth, i think it likely that portland design works were more conserned with the urban commuter rather than the country boy on his cyclocross bicycle. the anodised aluminium construction makes for a very solid unit which, on current evidence, is built to withstand not only inadvertant contact with the ground, but also the bulk of inclement elements. so far it has resisted freezing temperatures, rain, hail and snow. it also has the more than favourable design feature of shielding the rider (me) from whichever lighting mode has been selected. there is nothing more irritating than riding at night and having to shield the effects of a flashing light with a piece of electrical tape. though i've yet to reach the limits of the battery's charge time, when the top switch illuminates to warn of low battery, there's still a further fifteen minutes of safety net to hopefuly allow reaching home safely. perhaps if those corsa drivers stay at home to watch top gear, there's always the possibility i might pop out every now and again after the hours of darkness with my lars rover accompanied to the rear by a portland design works aether demon rear light. but then again, the sitting room is quite cosy after tea-time. portland design works lars rover | the lars rover 650 retails in the uk £75 ($110) while the 450 costs £55 ($85). portland design works peoducts are distributed in the uk by paligap.